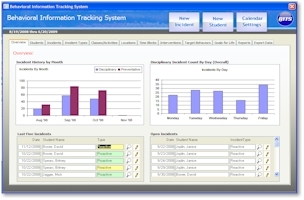 The BITS Dashboard is designed to give you an overview of Student Behavioral Incidents at a glance. This chart breaks out Preventative and Disciplinary Incidents by month so that you can easily see an overall trend in behavior. This can be a valuable tool in assessing behavioral intervention programs, changes in disciplinary policies etc. The Incident Count By Day chart summarizes all of your behavioral incident history based on the day of the week it occurs on. This means that you can prove to yourself and others that your students really do lose control more often on Fridays! 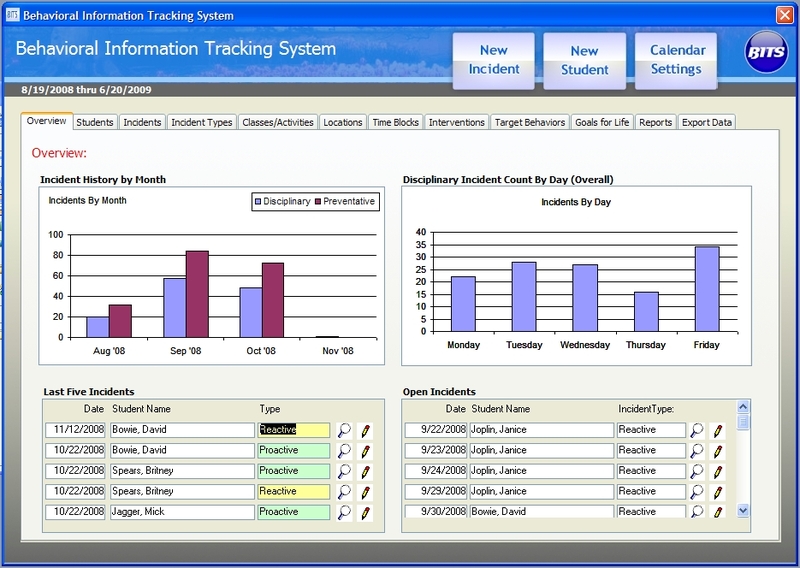 The Last Five Incidents box simply shows the last five behavioral incidents that you have recorded for your students. This is useful because often the most recent incidents are the ones that demand the most attention. By clicking on the View button you can see the incident details. The Open Incidents box shows you a listing of all incidents that are not flagged as "Processed". Open incidents have had no disciplinary resolution. This listing will serve as a reminder of outstanding issues with your students.